UPDATE | The memorial celebrating the life of Kim Maddox, a former Long Beach State hall of famer, LGBT advocate and Long Beach Police Department detective, has been scheduled for next Wednesday, September 28 at the Police Officer’s Association Park, Maddox’s surviving wife Angel Macias announced. Macias announced the service on Facebook late Wednesday. The celebration of life will occur from 11:00AM to noon, and the Gratitude Celebration will take place from noon to 3:00PM, according to her announcement. Beyond the wardrobe request, guests are encouraged to spread the word about the service, and Macias said officers wearing uniform would be welcome. The emphasis of the ceremony is on celebrating Maddox’s life, said Macias: “Food, drinks and entertainment will be provided and following in Kim’s wishes this will be a Celebration of Life worthy of her greater than life spirit,” she said. Parking is available at the park, with overflow parking located directly behind in El Dorado Park, said Macias. The Police Officer’s Association park is located at 7930 East Carson Street. On 09/13 at 4:46PM | After almost two years battling Stage IV ovarian cancer, former Long Beach Police Department (LBPD) detective and Long Beach State hall of fame basketball player Kim Maddox died early Monday morning. Maddox died peacefully, according to her wife and longtime champion Angel Macias. Mayor Robert Garcia said the city council would close in Maddox’s memory. Maddox leaves behind wife Macias and the children she and her wife adopted. Maddox had been diagnosed with cancer in December 2014, fighting through its metastasizing to her stomach, lungs and lymph nodes. Chemotherapy wreaked havoc on her body, to the point where her liver enzymes were too high to continue. She had successfully raised money for alternative treatment and relocated for the treatment at a hospital in Mexico. It was during treatment when she died. Maddox’s fight against cancer was part of a history of activism. 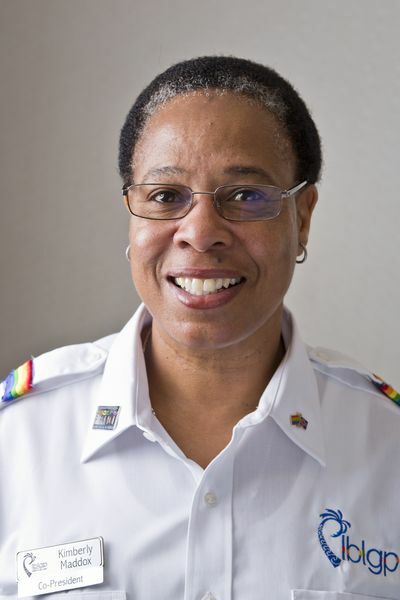 After serving as the co-president of Long Beach Lesbian & Gay Pride, Inc. years ago, she retired from her job as a LBPD detective to have time to take care of her wife’s brother’s children. Her cancer diagnosis came shortly after. The events also came after a life as an athlete, playing for four years for the Long Beach State 49ers women’s basketball team and playing professional basketball in Europe. At Long Beach State, Maddox still ranks among the top four performers in all of the key career categories: points (1775), assist (461), field goals (779) and steals (219). She participated in the 1980 and 1984 Olympic trials; she played for the U.S. National Team during its 1978 tour of the Orient. During her treatment, Macias was struck by Kim’s concern for other patients—which appeared to be more than for herself. “She cries more for friends than for herself,” said Macias in an interview a few months ago. Friends, loved ones and community leaders poured their grief out on social media Monday while processing the loss.